The Quebec government wants out of the contentious Apuiat wind farm project?and has tapped Hydro-Québec to come up with an exit strategy, Radio-Canada has learned. The?Apuiat?project, first proposed in 2015, is?to?produce an estimated 200 megawatts annually from about 50 wind turbines on Quebec's North Shore, near the town of Port-Cartier. Backed by the former Liberal government, the $600-million project was highly criticized by the?CAQ's?Fran?ois?Legault during the election campaign. Société?Apuiat, which represents the Innu stakeholders,?and Boralex released a joint statement Tuesday, saying they were "disappointed to learn of the government's intention regarding our project" without having had a chance to present it to the?new government. The fact that that the government is now expressing its lack of support for the project without having spoken to the Innu promoters yet is unacceptable, said the Chief of the Assembly of First Nations Quebec-Labrador,?Ghislain Picard. "The Innu Nation is the promoter of the project?— for me, it's important that the promoter isn't left out of such an important decision," he said. For Alain Thibault, the?mayor of Port-Cartier, where many of those jobs would land, the CAQ's?haste?to pull the plug on the project comes as a surprise, after what he thought was a promising meeting with Julien last week. He said if Apuiat is dropped, the?CAQ?will have a hard time promoting any new ventures?in the region. "Every time he will want to break ground in Nitassinan [the Innu?territory], he will have to sit down with them." "The Innu?are no longer in a mindset of just receiving annuity from the government," said Société?Apuiat in its statement.? "On the contrary, Innu?want to implement their own investment projects, to build something that is sustainable and renewable, to develop expertise and pride." One of the premier's main arguments against the project during the election campaign was the Hydro-Québec president and CEO?éric?Martel's lack of support for the wind farm, made public in a letter?last August.? Boralex and Société?Apuiat?challenge that analysis in their statement, claiming?that?by the time the wind farm would be up and running?in 2022, "the margin of manoeuvre Quebec has in its energy supply will be running out."? 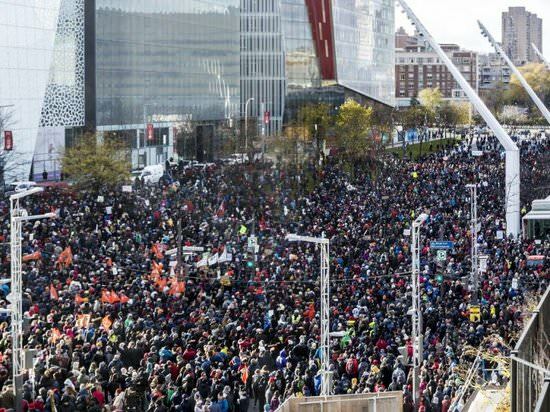 Thousands of people took part in a march for the planet at Place des Festivals in Montreal on Saturday, Nov. 10, 2018. Supporters want Premier Fran?ois Legault to step up the province's efforts to fight climate change. We need smaller schools and smaller classes throughout Quebec. And some sharing of buildings by the two linguistic school baords would have been an innovative solution, taking account of the need to consult students and teachers. But this is not a government that believes in democratic school governance.? And that is, yes, why anglos tend to vote Liberal. If QS starts to stand up for minority-langauge education and democracy in school governance, it may get more anglo votes. (It already gets lots among anglo university students, of course.) Until then, it's no shock that a minority community will vote for the only party that appears to be defending?them.? Granted, the overall purpose of the proposed?ban is probably to?lord it over people?from minority faiths. ? ?